← Viagra threat to Champagne sales? 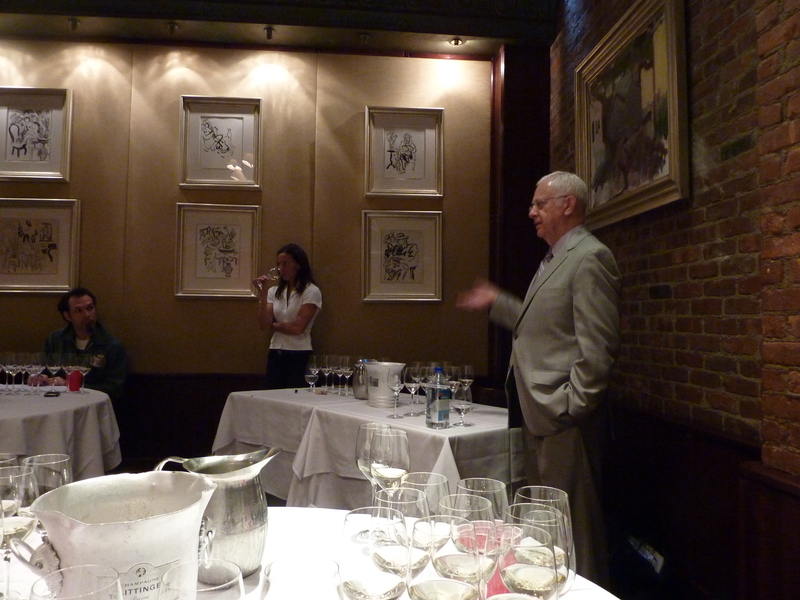 Rudi Wiest and Laura Williamson presenting "The Top Wines and Grosses Gewachs of 2008" at Rudipalooza this week. Rudi Wiest imports some of the best German Rieslings in the world and he led a seminar at Tribeca Grill this week, where we sampled 9 different wines. Rudi had some great quotes throughout the seminar, including the title of this post. It is silly to describe wines as intellectual, but this line-up was nuanced. “If you don’t write it down, you’ve never going to be a good taster.” It’s a good thing I keep this blog. “Is there another grape that can do what Riesling does?” I couldn’t agree more. My favorite dry wine was the 2008 Rebholz Riesling Dry Grosses Gewächs, Im Sonnenschein. Grosses Gewächs translates to “great growth” and refers to a system the Germans use to rank vineyard sites. Im Sonnenschein is the vineyard name. The grapes are grown in limestone soil, laden with martime fossils and the resulting wine was very different from another Rebholz we tried, where the grapes were grown on sandstone, just 200 meters away. The Sonnenschein was round, ripe, smoky and had lots of floral, citrus and peach notes. The acidity was the best part; it was so integrated, it had become one with the wine. My favorite off-dry was the 2008 Reinhold Haart Reisling Spätlese, “Erste Lage”, Piesporter Goldtröpfchen. Erste Lage translates to “top site”, similar to the idea above. Piesporter means near the town of Piesport and Goldtröpfchen, meaning drops of gold, is the name of the vineyard. This wine had a ton going on: flowers, black fruits, stone fruits, minerality and a finish that went on forever. Rudi mentioned that when he has a Piesporter wine, he thinks of peach trees. He was right again.